With Brexit, the election of Donald Trump to the White House and allegations that the Russian security services might have helped put him there, it is surprising there haven’t been more novels to attempt to tackle such themes. Perhaps this is the first in a new trend, that just as after 9/11 not a few novelists attempted to tackle the rise of Islamic fundamentalism, a wave of literary efforts attempting to explain the strange new world we’re faced with is just upon the horizon. If this is so, Stanley Johnson might at first glance appear an unlikely trailblazer. He is after all the father of Boris, the quirky and some might say controversial politician, Foreign Secretary and leading Brexiteer. This would be unfair however as Stanley is the author of twenty-five previous books, both fiction and non-fiction, a former Conservative member of the European Parliament, and a leading environmental campaigner. The Johnson family are also known to speak their minds, even if this might upset their most famous member, as his sister Rachel (Stanley’s daughter) did when she joined the Liberal Democrats in protest at the Conservative’s support for Brexit. So perhaps it’s not so surprising that Stanley has penned a satire of the current geopolitical environment. But is it any good? With such broad themes one might imagine Stanley to have produced a doorstopper of a book, certainly before I received my print copy from the publishers I was expecting something along the lines of 500+ pages. 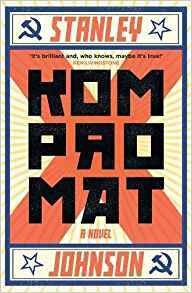 In fact, Kompromat is exactly 302 pages, which while normal for a typical work of fiction, when one considers the complex ideas involved and the fact that the book has a cast of over 100 (there’s a 5-page cast of characters listing at the beginning) might come as a surprise. Obviously, most of the characters prove to be walk-on parts, the main character perhaps being Edward Barnard, a leading Conservative Party Brexiteer. I say he’s the main character as he appears most in the novel but close on his heels are the Russian President Igor Popov, the controversial American businessman and Republican Presidential candidate Ronald C. Craig, and Mabel Killick, the UK Home Secretary and later Prime Minister. One of the fun aspects of this book is playing guess who. Igor Popov is obviously Vladimir Putin, Ronald Craig is Trump, while Mabel Hillick is Theresa May. There’s a character based on Cameron, a Rupert Murdoch, a Hillary Clinton, and yes, a surprisingly small part for the “ebullient and charismatic” former Mayor of London, Harry Stokes. You might assume that such a large globetrotting cast might make the novel unwieldy or a mess of competing narratives, but not a bit of it. This is a novel that trots along at quite a pace. The author does an admirably good job of joining all the threads and at no point does the novel meander or the plot get lost. As befitting a satire it’s also a surprisingly light-hearted novel, not a mean feat considering the weighty topics that it addresses. There are twists and turns galore, with not a few surprises. There are also some laugh out loud moments. Despite all this, Stanley Johnson spins an all too plausible tale and while I’m not suggesting that he knows anything we don’t, one just has to watch the news after reading the book to know that some of what he portrays might just be on the mark. That all said I did have a couple of issues with Kompromat and strangely it’s that what makes the book so good also does it an injustice. Its fast pace, multiple international settings and global cast of characters, while enjoyable, mean that there’s little depth here. Apart perhaps from Edward Barnard and his wife we never really get into the heads or hearts of any of the other characters. Similarly, there’s a feel of frivolity to the novel, which while in some senses is refreshing in a political story – the genre can all too often be dauntingly heavy or preachy – can at times come across as trite. Finally, due to its broad scope, the author can’t help but neglect aspects which depending on the reader might feel strange. An example of this is that Simon Henley (a thinly disguised Nigel Farage) hardly gets a mention. I’m not a fan of UKIP, but a novel that tackles Brexit while hardly featuring the party and its most famous leader, in my opinion makes a very odd oversight. So back to my original question, is Kompromat any good? Well yes, it is. All in all, it’s an enjoyable satire, a romp if you will, while still being all too scarily believable.